Tomorrow’s NC Policy Watch Crucial Conversation, “North Carolina’s constitutional amendments blitz: What should be done?” featuring former legislative counsel Gerry Cohen, Senator Floyd McKissick, Jr. and “Tuesdays with Tillis” activist Karen Ziegler is a sell-out. Due to space constraints we’ve had to cut off registrations. Happily, there is still a way to watch the event — both later and as it happens. To do so, head to the NC Policy Watch Facebook page a few minutes after 12:00 noon tomorrow, Wednesday August 8. 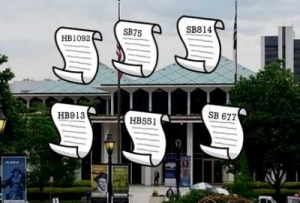 In the final harried days of the 2018 legislative session, North Carolina lawmakers took the unprecedented step of voting to place six constitutional amendments on the November ballot. The amendments deal with a wide-ranging array of subjects: the right to hunt, fish and harvest wildlife; the rights of crime victims; changes to the state board of elections and the transfer of appointment powers from the governor to the legislature; selection for judicial vacancies; a cap on the state income tax and requiring a photo ID to vote. In the weeks that have followed, a growing chorus of critics has emerged to decry the amendments as individually flawed and, collectively, a massive and deceptive power grab by legislative leaders. Unlike virtually all previous amendments in recent decades, the critics note, five of the six amendments lack basic implementing language that would even allow voters to understand what they are voting on. So where do things stand? What would the amendments really do and not do? What will happen next if any of them were to pass? Hope to see you — at least virtually — tomorrow!